Our friends’ kids also don’t spend a lot of time around pets, and it was just adorable to see them so enamored with the cat and lizard, and even afraid of our sweet little dog! It was cute to see them warm up to him, petting him, then proudly telling their parents that they were able to. At first I was worried that we wouldn’t have enough to keep the kids busy, but with having 6 pets and a little play area outside, it turned out to be great for the 2, 4, and 6 year olds! There are some changes I would recommend from the original recipe – the original recipe says to use one pound of ground turkey to make 6 patties…um…how is that even possible? Sometimes it can be difficult enough to make 4 patties out of one pound of meat! I ended up using 1.25lbs (it was on sale for cheaper than the 1lb package!) and made 5 burgers. Also, there is SO MUCH additional stuff in these burgers, that I actually had to cut it down a bit, because there would be literally almost no burger and all filling (which I suppose may have been their point, but it’s kind of hard to grill filling with minimal burger). As it was, we had to grill these on foil (make sure to spray your foil! ), so that they wouldn’t fall apart between the grates. 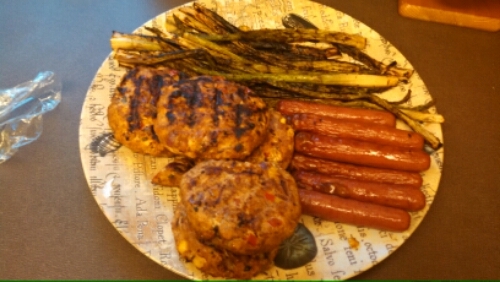 Also, I omitted the jalapeno (but kept the bell pepper – and my husband didn’t mind! Score!). I also only used half a red onion, to save for a yummy watermelon salsa I also made (check the blog soon for that recipe), and only used half of the red bell pepper because, again, there was just so much filling. For the recipe below, I am going to post using my alterations, from what I can remember, but if you’d like to compare and contrast, definitely check out the original recipe – feel free to make it your own! Bonus: we used fresh cilantro from our garden! Yay! -Add one tbsp olive oil to saute pan over medium heat, then add red pepper, onion, garlic, frozen corn, 1 tbsp cumin, and 1 tbsp chili powder to saute pan. Saute until golden brown. Add juice from one lime and mix to combine flavors. -In a mixing bowl combine lean ground turkey with the veggie mixture. Add remaining cumin and chili powder (if you want to – 1tbsp of each was actually pretty decent). Mix in chopped cilantro, panko, and egg white. 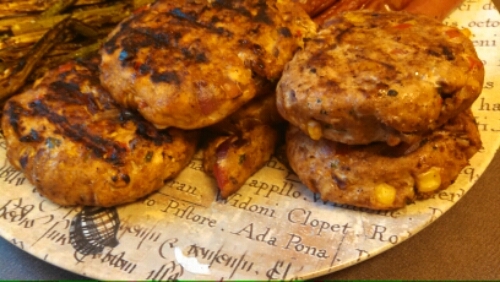 -Form patties, stuffing some cheese into the center, and then fold the meat around. -Top with condiments of your choice, on the buns, and serve.